Cyclists from throughout Stanislaus County came together recently to celebrate a special gift from the city of Modesto—new bicycle lanes that will make it easier and safer to traverse the city on two wheels. 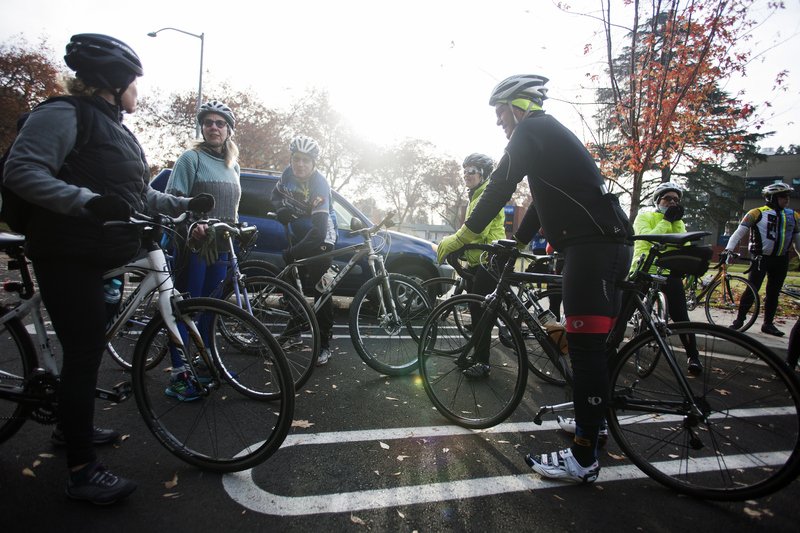 Approximately 25 members of the Stanislaus County Bicycle Club gathered on Saturday December 5th at Modesto Junior College, where the most visible part of the recent bicycling improvements have been made, for a celebratory ride. 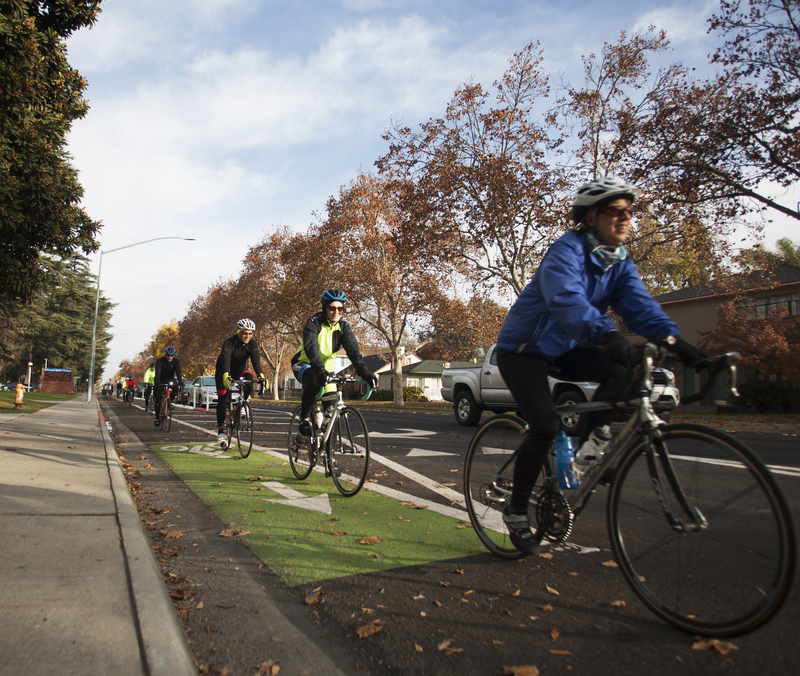 The bike ride started on College Avenue, where the city has implemented a road diet, and continued down 9th Street’s new curb-protected, two-way bike lane connecting the two campuses of Modesto Junior College. The group returned via the new Briggsmore Avenue bicycle lanes. Those with extra energy to burn on the cold morning continued on to the 35-mile route Dion had scouted the day before. Typically, Sacuskie said, the department tries to follow the existing non-motorized transportation plan, but the new direction has been: “any time we can accommodate a bike lane, let’s try to.” This was the case with College Avenue, which didn’t initially call for the buffered bicycle lanes it now has. They were nonetheless added to a repaving project. The improvements have brought a few phone calls from residents who don’t understand why the city is putting so much effort into bicycling infrastructure. But, said Sacuskie, he was surprised there weren’t more. In Modesto, people are mainly supportive of the new bicycle-friendly direction. “It’s public support that is going to keep things moving,” Sacuskie said. The next project he’s working on is connecting the Virginia Corridor, a 4.2 mile trail, to the new 9th Street cycle track. Even though the crowd that went on the celebratory ride was made up of mainly of people who are already bicycling enthusiasts, club member Karen Shoup said she plans to invite the commuter students who take classes at both campuses of Modesto Junior College to a group ride on the new bicycle lanes. “I heard that it is faster taking the bike lanes than it is driving,” she said. Dion, who bicycles to work in West Modesto, said the increased connectivity has given her something she didn’t have before. Great article, and a someone who bikes to work 3 days a week in Modesto, I could hardly believe more. On another note I would like to use some of your pictures on another website. Can you get in touch with me about permission to use them? Nice work–Modesto has been doing some cool stuff! This is why we really need to change state law to *require* complete streets–and great ones designed to data-driven best practices for walking and biking. California needs a real #CompleteStreets policy, one that mandates protected biking and walking improvements when state funds are used to repave roads or repair bridges. We are thankful to Senator Jim Beall for including sensible complete streets provisions in SBX 1-1 in the special session that mandate the inclusion of “new bicycle and pedestrian safety, access, and mobility improvements” in every project funded by the state. It calls for sidewalks and protected bike lanes or bike paths in transit-dense areas on most roads with a speed limit over 25 miles per hour. We need these Complete Streets policies in any transportation deal that’s made in Sacramento. The city of Modesto has worked to improve it bicycling culture by improving its infrastructure, and gets to celebrate that on Bike to Work Day. 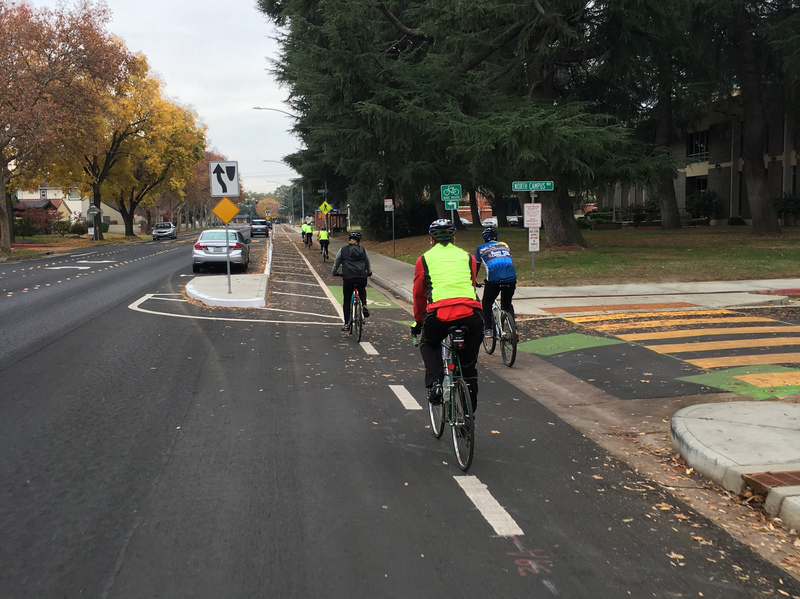 Modesto, California: A Model for a Bicycle-Friendly City? The planned changes should bring similar safety benefits and speed reductions seen after a road diet was completed along College Avenue. County staff and partners say the project will transform the community.